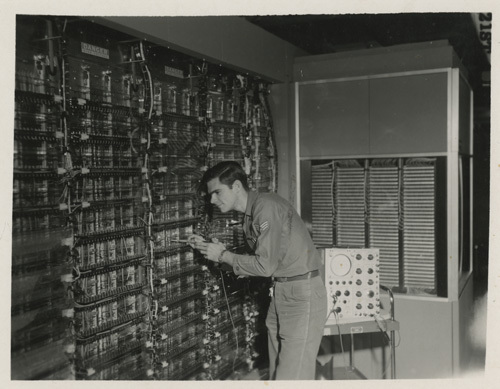 The donor writes: "Sargent Haskell using a Tektronix scope to look at waveforms. The large mass on the right is what we called big memory. 256 kilobytes of scratch pad memory. Individual strung ferrite cores. Man did I get in trouble with this photo. I am violating a primary safety directive, wearing my watch while working around high voltages. These photos were staged so there was no danger but my chief reamed me out for it."